However, before the fun of sailing actually begins, some work needs to be done in order to bring your vessel to the destination point. The procedure of shipping a boat greatly differs from regular car shipping because there is totally different logistics required for both loading and transporting the boat. • Include all kinds of watersport boats (ski boats, jet boats, PWCs etc. ), bass boats, walkarounds, aluminum fishing boats, bowriders, pontoons, lightweight sailboats etc. NOTE. 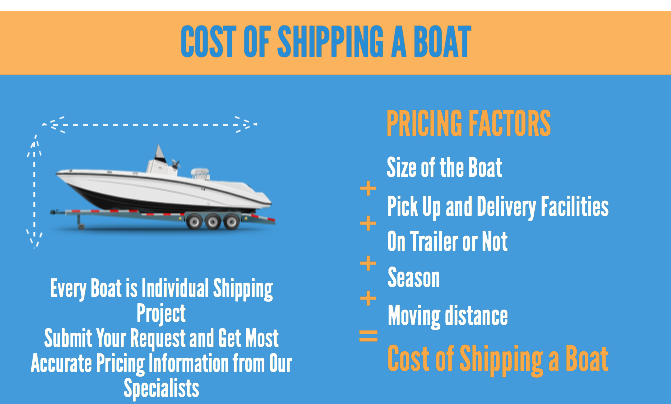 It is also very important to know the exact dimensions of your boat (its height, length and width) in order to receive the most accurate pricing and choose the right way of shipping your vessel. WHAT ARE THE WAYS TO TRANSPORT A BOAT? 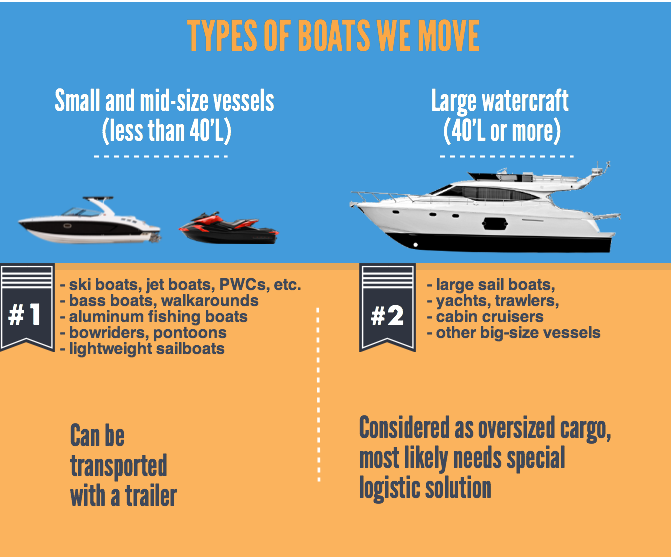 Every boat shipment is unique as it is determined by several factors, such as the size of the boat, facilities available for loading, carrying or towing the vessel from one location to the other. Each state has certain size and weight restrictions for commercial motor vehicles used for towing or carrying vessels. If these restrictions are not met, a special permit or rerouting will be required. In case the size if your watercraft exceeds any federal or state road restrictions, our team will work on finding the best logistics solution to perform the transportation of your boat by contacting all the carriers available in your area. Once you decide on the most suitable way to ship your boat, the next step is dealing with various types of loading the watercraft. 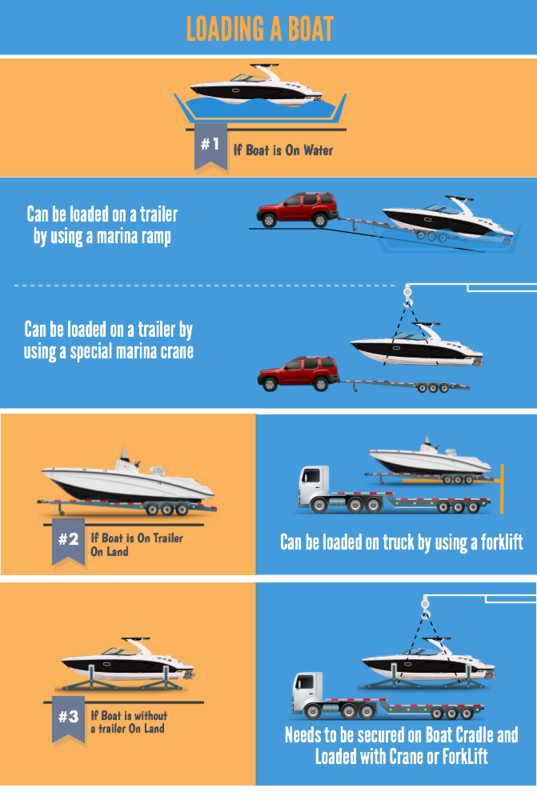 UNLOADING a boat upon delivery can be performed the same way. Loading the boat off the ruck also requires the same equipment as the one used to load it at the pick up location. NOTE. Time of the year can also affect the loading conditions of your vessel especially if it stays on the water in winter. A lot of marina facilities are not available during winter months and trying to load the boat on the trailer can be very dangerous when there is ice on the water. 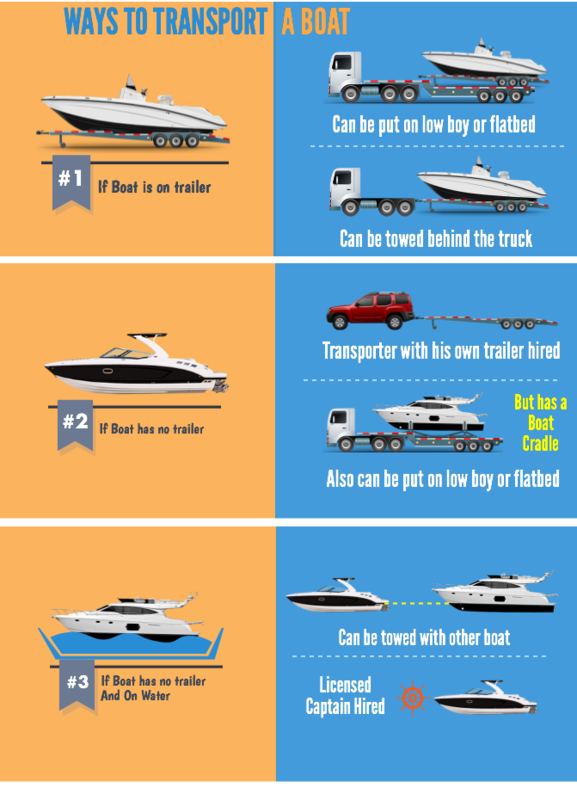 Read more useful tips for shipping a boat. 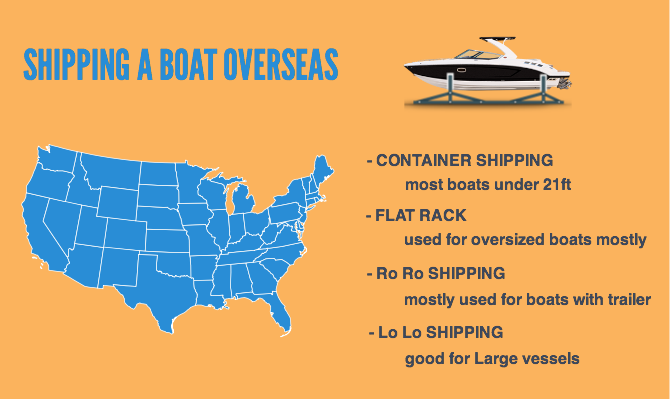 There are 5 different ways to ship a vessel internationally, depending on the size of your boat. We deal with various types of international boat transportation, operating all year round and meeting particular needs of every client. Read more about our international shipping service. Due to complicated nature of boat shipping, specific requirements for loading and transporting each particular vessel and other arrangements needed for the transportation the price can vary greatly. 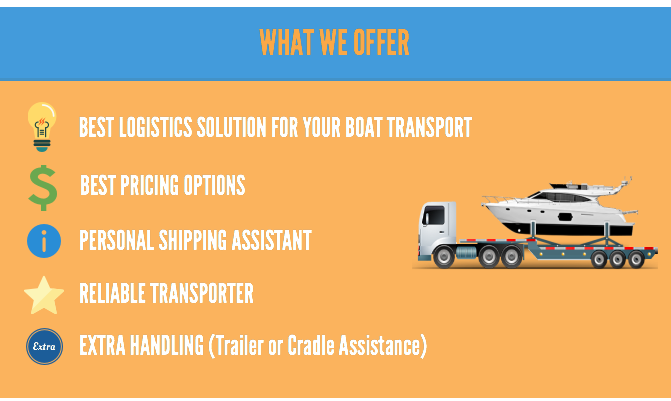 Please, contact us to specify your shipping needs and the boat dimensions and we will provide you with a customized quote in less than 10 minutes.